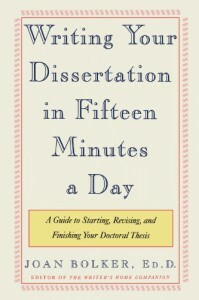 A book with advice for dissertation writers, from the very beginning (choosing a theme) to the very end (defending the thesis, publishing it, and so on). The title does a disservice to this book. It isn't about writing a dissertation in fifteen minutes a day, it simply argues that in order to write effectively, you should write everyday, even if you feel like you're not getting anywhere. I have put this into practice, not exactly writing in my dissertation everyday, but writing about it everyday: one of the advices the author gives is to keep a dissertation diary in which you log all the thoughts, doubts, questions and worries you had about your work that day, what you read, how much you wrote, etc. This was great advice, at least for me. I've found that I actually think better and more clearly if I'm writing, and it's good practice to avoid feeling intimidated by the blank screen (or page) when the time to write more seriously comes. Other useful pointers include taking care of yourself, physically and mentally, setting daily goals, try to reward instead of punishing yourself, and dealing with advisors. Still, even though this was the first book I read on the subject, nothing here is groundbreaking, and it's very general advice. If you're looking for something more specific to your own area of study, you might want to start elsewhere.